Yesterday when I said that Stefanie and Zeinab had made fun of my old, no-USB-power wall outlets, I guess you could say that technically, I was, you know, “lying”. Since they never actually made any such complaints. But I’m definitely truthing you when I say that Stefanie and Zeinab did not like American bread. Too soft! They put a bunch of slices in the oven every morning to toast them and make them a little more like the bread they’re used to, but that only got so far. I went to Mothers Market in Costa Mesa to see if they had something better. I thought they would. But they really didn’t. 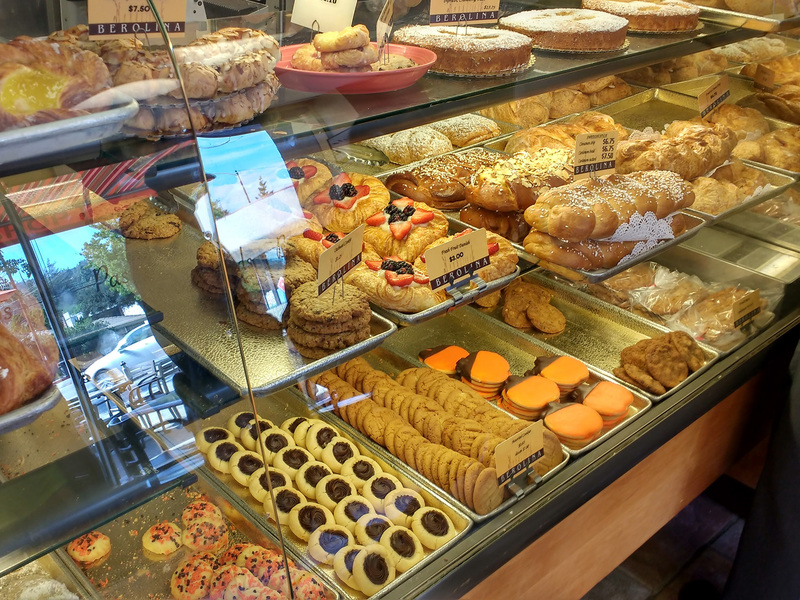 So we googled around for German bakeries in Los Angeles and finally found ourselves on our way up into, well, not quite the Bavarian Alps of Sonthofen that Stefanie and Zeinab are from, but the somewhat lower hills of Glendale near its border with La Cañada Flintridge. 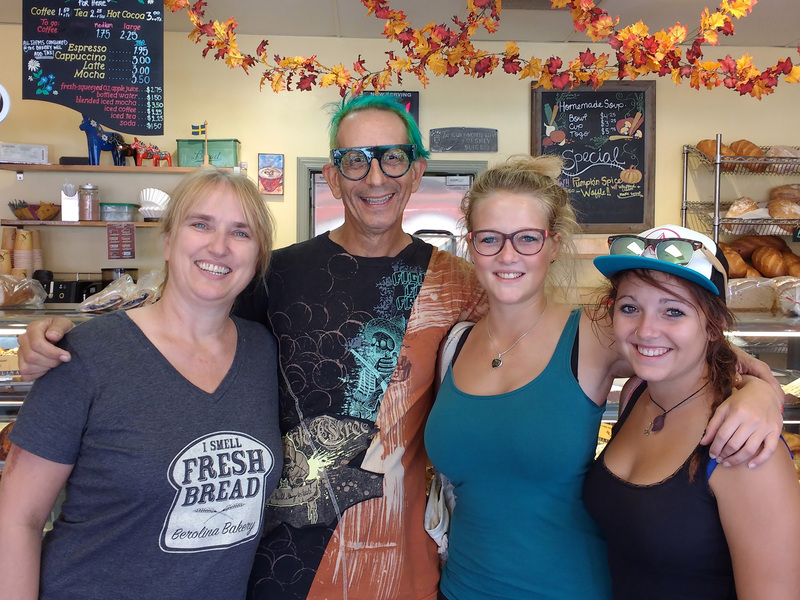 When we entered Berolina Bakery, Stefanie and Zeinab were immediately excited. They could tell in an instant that they had finally come to the right place! I forget which delightful bread Zeinab bought, and you could see the emotion in Stefanie when she saw their German Seed Bread. I bought a great French Baguette for Kevin and Anthony, and also an Italian Focaccia that even after I slightly overcrisped (burnt) the top and had to cut it off, was still so delicious that everyone marveled at it when we ate it before dinner. The owner, Youna Karlsson helped us pick out a small cookie for Steffi’s grandmother Anni. It was so nice meeting you guys that day! I wish your visitors had found us earlier. Because I know the Europeans LOVE their bread! Thanks again for coming and we hope to see you guys soon! Hi Youna! Thanks so much for your hospitality! 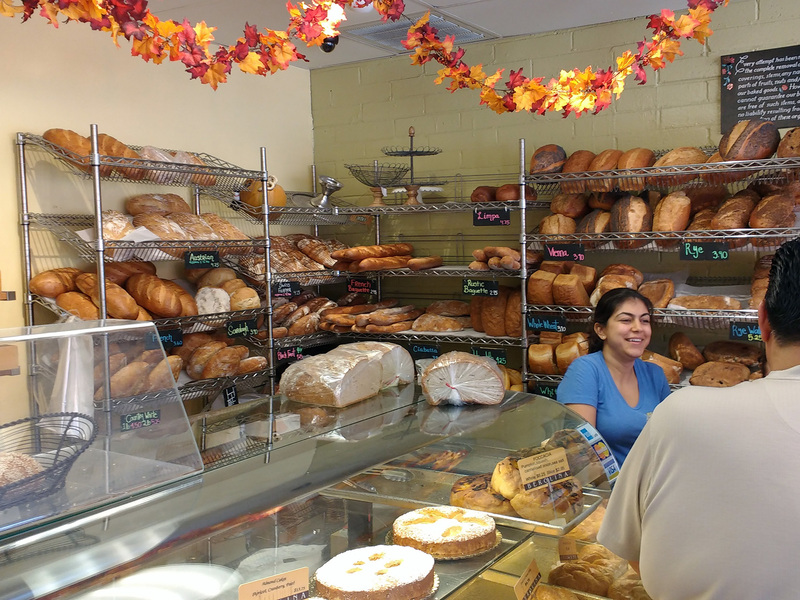 As you already know, Stefanie & Zeinab were delighted to discover Berolina Bakery! As you say, it’s too bad we didn’t find you earlier – they just jetted off to New Zealand on Monday night! It will be a long while before they have the opportunity to visit Berolina again. But after “suffering” with nearly a month of American Bread, I know how happy they were to meet you and enjoy your baking. Even though they might not be back, I’m sure I’ll be back, whether it’s with other European visitors, or just to enjoy your breads. How much longer will you be serving the Pumpkin Spice Waffles? I think I may have to come by and try them!